Lumenor believed, but he had never SEEN it seen it. Not with eyes of flesh. When the creatures attacked, his companions fought, but Lumenor was still with a quiet zeal. First he rebuked his own cowardice, but then he understood. The fire was quick... alive and merciless. The creatures were consumed, those who lived, friend and foe, scattered. Lumenor's body ignored the flames, but his spirit stoked and accelerated the torrent. But in it was not chaos. Not madness. But a method. A way. A mission. After. Lumenor wandered, both in body and in spirit, from vindication to despair for lost comrades; from madness to satisfaction. The forest loomed in darkness as he ran and stumbled and danced. It WAS real. Drizzle. He was right. Mud. His faith had been rewarded. Flash flooding. A sapling. And a still small voice? Yes... A... Voice? "What I burn I burn. What I spare I spare. You see that I burn because it is a TIME for burning. But stand vigil with me a while and I will show you. One day I will quench, and seed, and water, and season, and harvest. Do not lament what I have burned. And do not lust for the burning of what I have spared. For it all belongs to me, and you shall be my steward both in burning and in flourishing." Lumenor may now take levels in any class if you so choose. He may now use spellcasting that doesn't have a natural explanation. Chef was thrown from the flames that both slew his attacker and cauterized his severed artery. Disabled, he crawled into the woods. To live? To die? Exhausted, he did not care. To rest, alive ir dead. His sleep was haunted by loss and death. By failure and sometimes unimaginable pain! The soothing rain eased the pain, but exascerbated the numbing failure. Then a start, a jolt that began Chef's ascent. Something... Something was... Something was licking him. Theodras' dog has found Chef. Lumenor is asleep at mid-field. Nicely done GM, love it!!! I'll continue to level in "Shaman". It fits the mystical and wild nature of the character. Lumenor sits quietly, contemplating his vision and mission, considering when and what and why to burn. Red-eyed Raven descends from a lazy overhead circling and lands on the ground near his slumped form. "Happy to see you too, Pooch. Now where did you come from?" Chef will drag himself to his feet and check his surroundings and his companions. Theodras approaches the slumped figure (Chef? ), hand on his sheathed sword and asks "Are you friend or foe to the lord of these lands?" 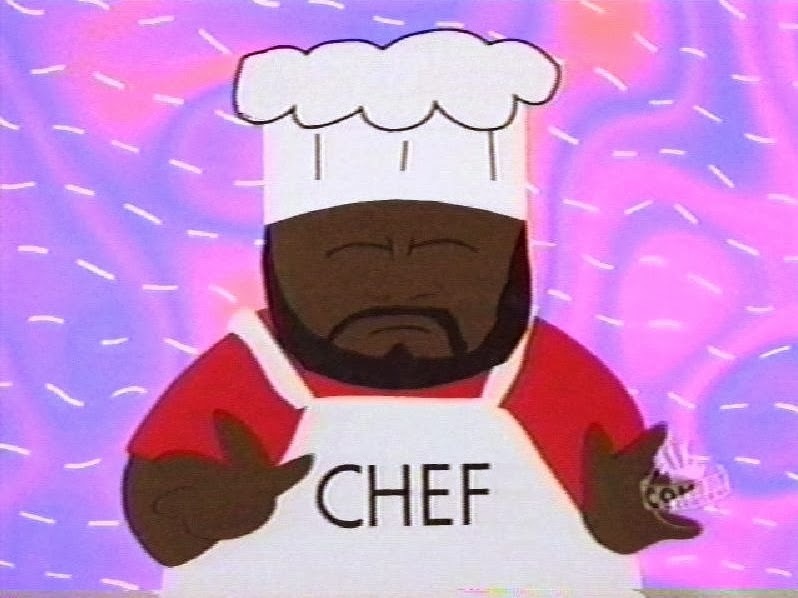 Chef is already standing on his feet. "Hail traveler! Who are you? I am called Chef and I only serve the mighty Cullen, the Ascended One, greatest of all food artisans! Barring his divine grace, I am willing to serve any blue-blooded lord who cares to pay me fair gold, in return for my brawny services and and culinary crafts." The tall forest-clad figure takes his hand off his sword and relaxes. "My name is Theodras of Blacrock. I'm a ranger in the service of Lord Kusley." As he pulls back his hood you see a combination of human and elven features beneath his tangled blond mane. "Can you tell me what happened here then? I've been following the tracks of a raiding party though the countryside all night. You didn't happen to come by way of Lastwater, did you? I'm thinking they're headed that way, and I need to warn the townsfolk." "Well met, Theodras! One of the fey-folk, eh? I've heard tales of your kind. The notoriety of the succulent feasts of the Elf Queen are known even in the slum kitchens of Roach Hole! How I would dearly enjoy to hear what comprises the secret ingredients of lambas bread. Aye, a funnel cake would be a splendid trade for such a recipe!" "Ha ha! You're a jolly one. All this talk of food is making me hungry. But I really need to be on my way." Theodras dons his hood again and turns north, surveying the night landscape. Are there any signs of the tracks continuing north toward Lastwater? Theodras turns again toward Chef and says "Looks as though I have found where my quarry met its end. What exactly happened here, so I may tell my lord?" "The Cleansing Flame" states Lumenor reverently as strides towards the pair. "It spoke and made clear its will. We stand here reborn by its grace, and you stand here called by its purity. Rejoice!!" "Aye, well said Lumenor! There's nothing like a blazing fire to expunge your foes, or slow roast a mutton!" Theodras has been tracking all night. The sun is just above the tree line now, with the three new companions a half a day from Lastwater. Anyone have knowledge local or geography? Gimme a check. "I've been in these woods before, boar hunting with the squire's nephew." The town of Lastwater doesn't actually have a name. It is a small shanty-town favored by eccentric merchants, smugglers and desert nomads. There is a well there with a sign that warns, "Last water before desert." It doesn't have a Lord. It is too small to be rowdy. Its only authority is a civillian commoner constable. The librarian there is respected by most of the town's regulars. "Last water is a wretched hive of scum and villainy. We'd best watch our step. May I suggest we approach town from the less obvious path? You never know who might be watching. We should stay off the road, at least once we are near town. Perhaps Theodras should scout ahead." "Well, I'm not expecting trouble on the way there, now that this band has met its end." pointing to the bodies on the ground. "I know a few shortcuts through the forest. The two of you follow me and we should be fine." Theodras marches off toward Lastwater, now at an easier pace. Chef rolls any bodies for treasure, then follow Theodras. "And so the flame alights..." declares Lumenor as he sets off following the Theodras. Red Eyed Raven flies overhead, alert for signs of trouble. No. Remember where he left off? He is still there. Starving and helpless. Red eyed raven smells something he enjoys: charred carnage. The party comes upon a blackened and burned out Lastwater. Death and destruction lay everywhere. Bodies of men, women and childred slaughtered indescrimminantly show that the town fell suddenly and swiftly. Tracks scatter in all directions. Only the Well, part of the jail, and the tower still stand. Across the smouldering clearing, a lone armored figure sits idle and in apparent shock, (Chris). Ian sits slumped against the old well. 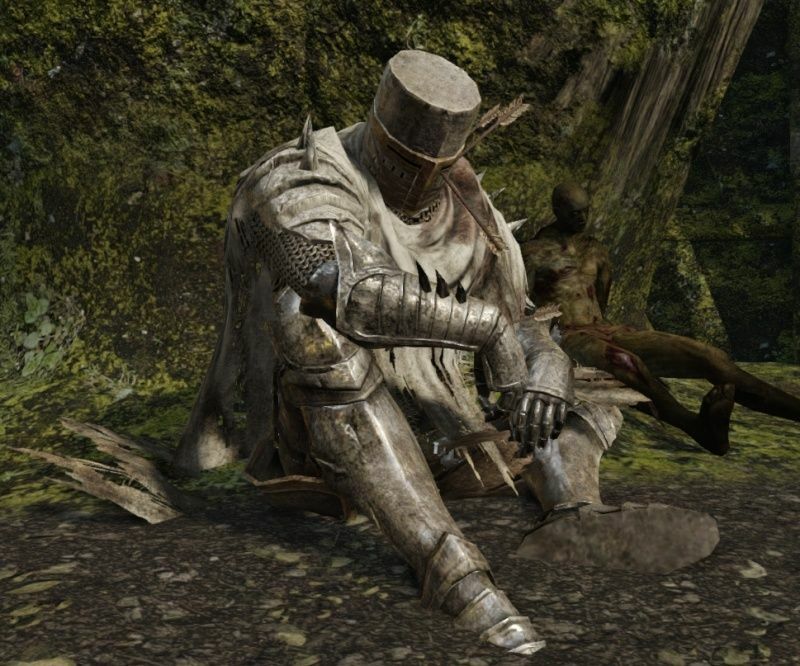 His helmet lays at his feet, next to his greatsword. His armor still has blood stains and grease from the morning's fight. navyik wrote: Ian has just fended off a wave of strange little creatures at ranch near lastwater. They are nothing like he has ever seen. They use advanced electro-mechanic technology and chemical weapons. He begins to worry about the village. He is too filled with self-loathing and regret to bother searching the wreckage for survivors. Ian's mind goes dark; he hopes they return and finish him. It would be a more merciful end than bearing witness to his enduring failures. "hey there... can anybody hear me?" whit10 wrote: "hey there... can anybody hear me?" "hey... is everybody else dead?" whit10 wrote: "hey... is everybody else dead?" Ian stumbles up to his feet. "I can hear you! Where are you?" He waves his greatsword overhead like a flag. "I'm in what was left of the jail"
Growing worried, Chef also smells the fire and ruin of town as the party approaches. He sneaks inside the village, opting to stick to shadows, walk along walls, and hiding behind smoke. He prefers not to be noticed. The butchers who did this may still be near. Once Chef fully grasps the scene, he pauses, standing silent. Chef is appalled at the waste of life. "Suffer not the children!" he whispers. Then he closes his eyes and vows silently, "Lastwater, by the cunning of Cullen, you shall be avenged!" Pulling himself together, he yanks some rabbit jerky from beneath his jerkin. Chef chews numbly, making his way slowly around the perimeter of town. He is searching for survivors and loot. Perception checks for Talek and Ian. "Keep calling out, I will follow your voice"
Red Eyed Raven patrols the perimeter of the ruined town, his keen eye wary for threats. Lumenor strides confidently towards what would have been the center of town, bearing his lit torch and kite shaped shield. "COME FORTH, YOU IN NEED OF SUCCOR!" he shouts. "BE NOT AFRAID!" He plants the bottom of the pointed shield firmly in the ground, then mounts the torch in the shield's sconce, and awaits those who he has been sent to gather and tend. Tarek notices a fat guy browsing the area, snacking. His tummy growls violently at the thought of food. He can also see Ian clearly. Chef hears Ian's voice calling out. Assuming Lumenor doesn't look like one of the creatures that Ian fought, he hollers as he passes by, "Some guy is trapped in the rubble of the old jail." Normally, the sight of a wild-eyed guy with a torch in the middle of a burned-down village might give a reasonable man pause... but Ian just ain't that bright. Ian lumbers at about 15ft spd (top speed is 20ft in his heavy armor, but he's had a rough day) towards the jail. "Hang on, fella. I am coming!" Chef will approach the source of voice (Ian). His sword is drawn, though he continues to stick to the shadows as much as he can as he advances towards Ian. "Uncanny," he whispers to himself when he sees the old paladin. "That chap looks familiar, but where do know that face?" Theodras moves around the outer buildings of what remains of Lastwater. He has his bow in hand, but no arrow nocked. He's going to casually walk around the perimeter of town very quietly, looking and listening for survivors or any remaining enemies. Ian will look for a way to free the singing guy. A metal key ring would have survived a fire. Ian will look for that or try to find some mechanism for opening the door. "BE AT EASE" he shouts into the collapsed rubble. "AID IS IMMINENT!" Ian sees what looks like a table leg crushed under a pile of heavy stones and timbers. Searching it will take some labour. Chef and Theodras find only desolation and death. The place was looted. Coast looks clear. navyik wrote: Ian sees what looks like a table leg crushed under a pile of heavy stones and timbers. Searching it will take some labour. Detect Evil (Sp): A paladin can, as a move action, concentrate on a single item or individual within 60 feet and determine if it is evil, learning the strength of its aura as if having studied it for 3 rounds. Ian calls out loudly and sounding out of breath, "Can anyone... whew... give me a hand clearing some rubble? There might be keys in here.... (pant) somewhere...."
Theodras moves in toward the group of survivors, and addresses Ian. "Hello, I am Theodras, ranger of Blackrock. Are there people trapped in this building?" After setting down his bow and pack he begins to clear the rubble with the others. Ian looks up startled at Theodras, "Eh! Paelor's Light, where did you come from? Wait.... "
Ian turns about in a circle slowly, as if trying to orientate himself, "How many people are hiding in the rubble?" Lumenor plants shield and torch firmly in the ground again, and goes to work moving rubble. "Did you see what evil transpired here?" he asks Ian. Ian is satisfied that none of the new folks pose a threat. MrBrownstone75 wrote: Theodras moves in toward the group of survivors, and addresses Ian. "Thank Paelor, a Ranger! I am lost outside of the city. Yes, yes, I heard someone calling from inside the old jail here. Come on, he may be hurt." Ian earnestly moves a couple small pieces of rubble, then welcomes the break as he answers the torch bearer. Ian sits on a partial wall to take a break. "Sadly, friend, I did not. But, I have some guess. Earlier this morning, I fought off a group of strange little green creatures. They had.... things, uh.... what's the word I'm looking for? Sorry, I never got past the 8th decree at Lord of Light school for boys in Starfell. Uh... contraceptions? No, no.... combustions? No, that is what happens afterwards.... Contractions! yeah, they had these big metal contractions that shot lightning and mad all sorts of loud noises." Still sitting, Ian makes his elbows stiff and moves his arms like a robot from the shoulders. He makes buzzing and whirring noises with his mouth. "I managed to drive that group off from the ranch where I was working as an extra hand. I was just passing through this area, you see. I am on a walk-about as they call it down south. I spent my whole life in Starfell, working for the city guard. I never left the city, not once in nearly 50 years." Ian makes motions with his finger, directing the other 2 men where to put the rubble. "So I said to myself, I may only have a few good years left that my legs will carry this belly around. By Paelor, I want to see some of the world, you know? Meet people, go places. I never saw anything like those creatures or their contractions though." "By the Light, where are my manners? I have been sleeping in barns for too long." Ian does smell a bit, now that he mentions it. "My name is Ian Trustram, formerly of the Starfell City Watch. I was the eyes and ears of the city for 34 years. I saw 9 different Captains come and go. I helped restore peace after the orkish race riots of '63. I kept order when them damn elven Rainbows came through in '72. Ha! I never saw so many dogs in one place." Ian has talked his mouth dry and takes a long sip on his water skin, content that he is entertaining the younger men as they labor.